Collbot is an open-source robot developed through a community effort. 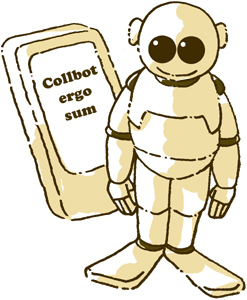 Collbot provides a home for a collaboration in robotics with the ultimate goal of creating an open-source, humanoid robot that is cheaply available. This website will be developed in the course of 2012. For now, you can find some ideas and general concepts here. If you have ideas to contribute, please do so via facebook. We approached the issue of developing a blue print for such a project from a very general point of view. Essentially, we drew out all the functions of a human body - assuming that the perfect humanoid robot will have to meet these standards or even exceed them. In the next step, we look at the technical side to define what we can realistically achieve. At first, we do this for hardware; then for the software to power it. The hardware, we will develop using existing kits, parts and new technologies such as 3D-printing, but we also want to use hardware readily available in many households - smartphones. The software will have to be developed in parallel.